EDIT: These horses are limited availability for now, so only about 40 of them are released to beta testers. You must wear the Water Horse group tag to purchase the horse. Water Horse will sell horses freely again when they iron out the bento head deformity bug. Bento has been pretty fun so far! I’ve purchased a few things, such as the Medhue Elephant and Red Remora’s Fennec Fox avs. Both are Bento-enabled and add a lot of fun to playing SL. So, here’s a new creation to add to this list: Water Horse has released their Riding Horse for beta testing. It’s a wearable vehicle but uses Bento bones to animate the mesh. No more claymation texture cycling! 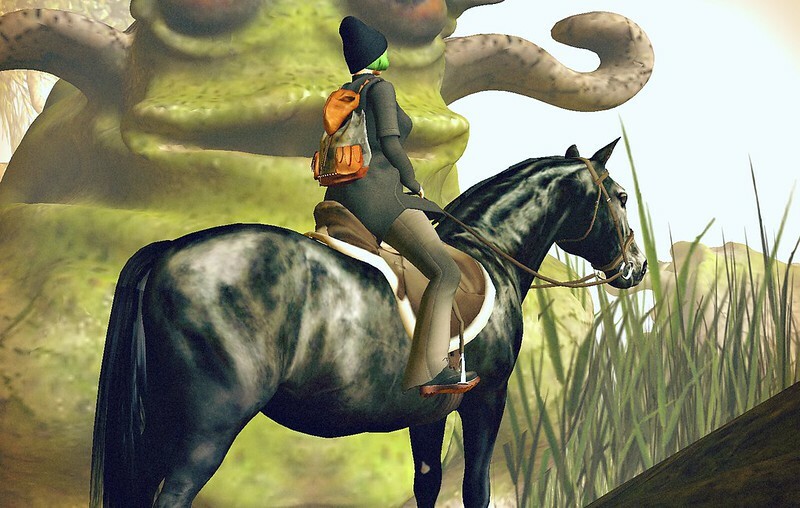 Your avatar will look like it’s riding a real horse in-game. Seriously. This exists in SL now. And currently, the horse is going for about 3500L. Less than a mesh head! That’s a steal. A few caveats if you buy the horse: it’s still in beta so there are bugs. They’re currently fixing a bug that deforms Bento heads when you ride the horse. They’re also looking for users to report anything else that’s wrong so the devs can fix it. Visit Water Horse in-world here. The movement looks amazing! What is Bento? They’re not selling any more beta versions. “Limited Availability”. EDIT: They didn’t sell out yet, looks like. You have to join their group to buy the horse. Darn! That means it’s sold out then. Thanks for letting me know!